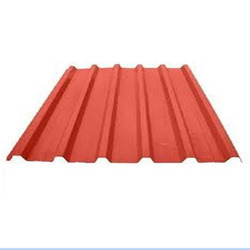 We are a leading Manufacturer of trapezoidal profile sheets from Hyderabad, India. Levering on our vast industry experience, we are committed towards offering a wide gamut of Trapezoidal Profile Sheets. The offered sheets are manufactured in conformance with predefined industry standards, with the usage of quality approved material and sophisticated technology. Clients can avail our offered sheets in large quantities within stipulated time-frame. Looking for Trapezoidal Profile Sheets ?